This Giving Tuesday was extra special for nine Special Olympics Illinois athletes thanks to the Finish Line Youth Foundation. Throughout the year, the Youth Foundation hosts shopping sprees under the name #OneSolePurpose to impact and inspire their team, community and customers while giving back to their partner organizations. Shoe giveaways like this provide these athletes with much needed shoes and apparel to participate in various sports. On Dec. 1, Giving Tuesday, it was the Special Olympics Illinois athletes’ turn. Each athlete was given $100 to spend on new shoes and apparel of their choice. See photos from Finish Line events. Special Olympics Illinois athletes Rylee, Miguel and Jude from Neumann Family Services, a group home on Chicago’s west side, spent the morning perusing the Finish Line store in Water Tower Place. Each athlete was properly fitted for new shoes, which was particularly beneficial to Rylee. 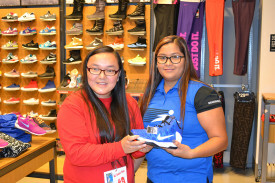 She entered Finish Line wearing a size 4, but left with brand new shoes size 7, in a shade of blue that matched her new hat, pants and sweatshirt. Later that afternoon, a second group of athletes gathered at the Yorktown Center Finish Line location for their shopping spree. Michelle, Dennis, Alejandro, David, Tori and Ailyn were all paired with a Finish Line staff member and started picking out gear. Athletes like Michelle, who smiled from ear to ear as she showed off her new pair of purple and coral Nikes, were recognized for their tremendous leadership. For athletes like Ailyn and Alejandro this opportunity is especially gratifying as their families do not have the resources to provide them with more than one pair of shoes. Ailyn came in wearing the only pair of shoes she owned, but left with a new pair of basketball shoes, a sweatshirt and more. The athletes posed for photos, modeling their new clothes and accessories – except David who, beaming, said he wanted to keep his shoes spotless before showing them off to his parents later that evening. At both locations the Finish Line managers from across northern Illinois formed a tunnel for the athletes to run through as their names were announced– collecting high-fives and cheers as while the Bulls theme song played in the background. The Finish Line Youth Foundation strives to make a difference in the lives of youth in the communities where employees and customers live, work and play. The Youth Foundation funds non-profit organizations that provide opportunities for kids to participate in community-based youth athletic programs and camps that emphasize active lifestyles, especially programs that serve disadvantaged and special needs kids. 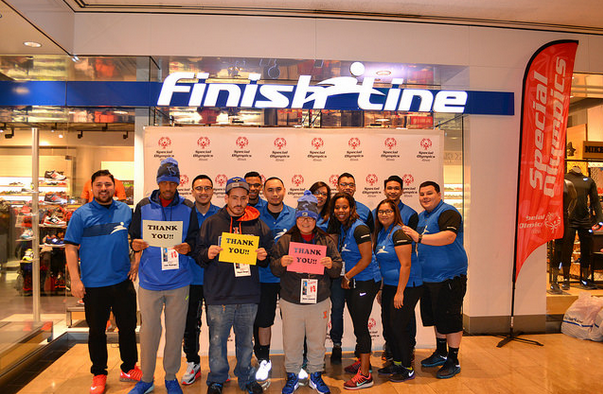 The community can help Finish Line make an impact by supporting Finish Line’s in-store and online holiday drive to support Special Olympics now through Dec. 31. Special Olympics Illinois thanks them for their generous contributions to the athletes.